State Farm is on a mission to make the festival experience more pleasurable for music fans. Forgot your sunscreen? Toothpaste? Need a bandana? Pop into State Farm’s Here To Help house to pick up what you need. The insurance company is tapping into the power of music, the power of community and the power of being a good neighbor to drive awareness of its new brand platform, Here To Help Life Go Right. Through a partnership with Live Nation, State Farm made its first music festival appearance with the new tagline at Bonnaroo in Manchester, TN; Lollapalooza was next, followed by Faster Horses and Austin City Limits. The brand also had a presence at 17 amphitheaters and select iHeart concerts through the summer. “When we talk about music, we look at what brings music fans together and it is really that shared passion for music that creates a community,” says Mandy Laux, marketing sponsorship/experiential manager at State Farm. “Part of being a good neighbor is to not only just be there, but also to be there in different moments and life experiences.” Which, of course, includes music festivals and their thousands of music fans. 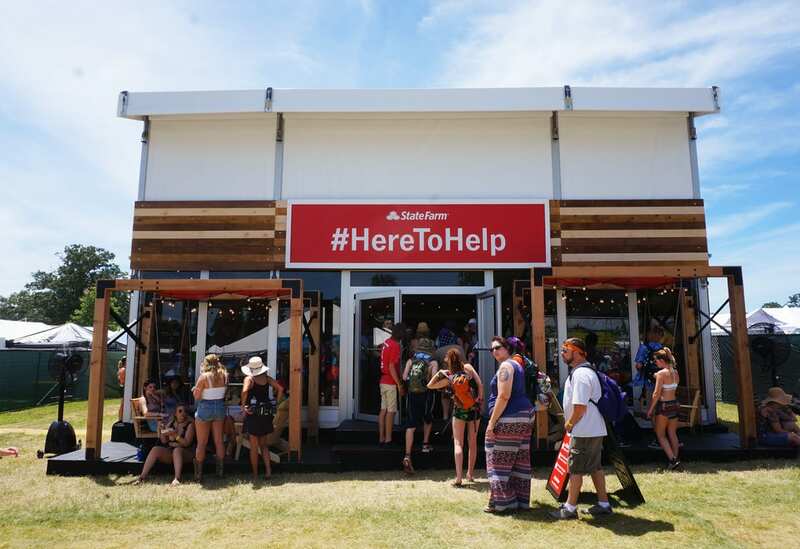 With the goal of providing helpful items for festival attendees and an atmosphere that would enhance their experience, State Farm’s presence at Bonnaroo centered on a 32-foot by 32-foot structure, one of the biggest in Bonnaroo’s Centeroo area. Wood planks surrounding the building gave it a rustic look and feel that fit with the Bonnaroo vibe. Fans could store their gear free of charge in lockers outside, then stop by and enjoy the swing and misting fans on the porch. Inside, the air conditioning offered relief from the 100-degree temperatures as festivalgoers lounged, recharged phones and caught the festival action on a flat-screen TV. The focal point of the space was the General Store where festivalgoers could step up to the counter and swipe their RFID wristbands to receive as many as three freebies a day. Attendees posted about the experience using the hashtag #heretohelp on Twitter and Instagram. A Here To Help social digital board inside the lounge captured their posts in real time. In addition, many used the hashtag as a virtual meeting place or to ask for something they may have lost or found. 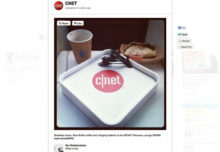 “The hashtag became something that could be used for various purposes. It was not only we as a brand helping consumers, but people helping people as well,” Laux says. 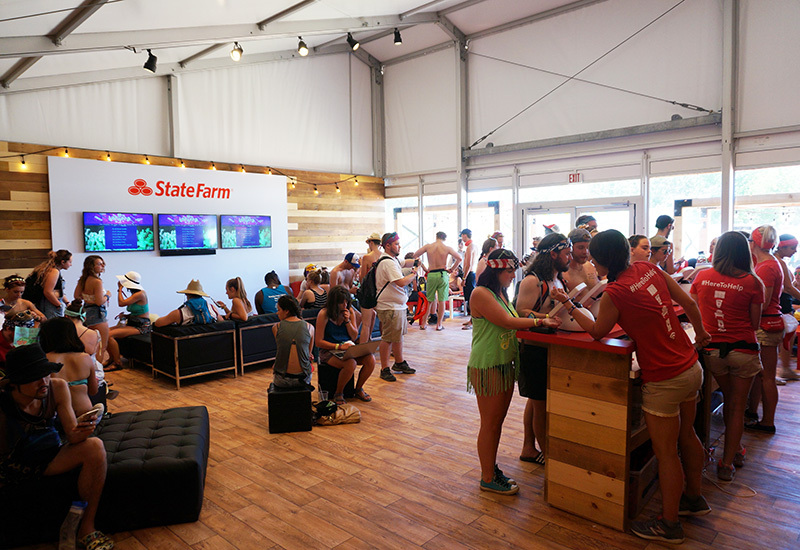 State Farm also leveraged its Bonnaroo partnership to push out its Here To Help messaging through the festival app, which led to lines of people outside its doors each morning, although a smaller outpost on the festival grounds also provided the same items as the General Store. Finally, as the festival drew to a close and it was time to pack up and go home, there were, as usual, a number of flat tires and dead car batteries to deal with. Once again, State Farm, which sponsored a tow vehicle and drivers, was there to help with that, too. 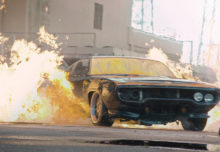 Agency: The Marketing Arm, Dallas. State Farm’s presence centered on a 32-foot by 32-foot structure, one of the biggest in Bonnaroo’s Centeroo area.